Nellie, Gigi and Loretta and tuckered out from a day of play. He found me bent over at the waist, with Gigi proudly perched on top of me. “How did that happen?” he asked, not expecting an answer. He gently cupped her gray feathers with both hands, and brought her to his chest. Gone are the days when I could pick up a chick with one hand. They are growing like weeds, and quickly start flapping their wings if we don’t hold them just right. In this case, I tried to hold Gigi with one hand so I could rub her chest with the other. In no time she escaped my grasp, and scurried up to my shoulder. In a blink of the eye, she walked down my back. Just moments before all three girls has been sleeping. They had a long day — almost five hours — out in the coop. We even had visitors, some friends who soon will build their own chicken coop. Their two boys had a blast crawling through the sand playing with the chicks. After our friends left, the chicks continued to fly back and forth, testing their wings, and chasing each other. No doubt they were tuckered out. Once I brought them inside, I had a special surprise: Watermelon! Their first non-chick food treat. 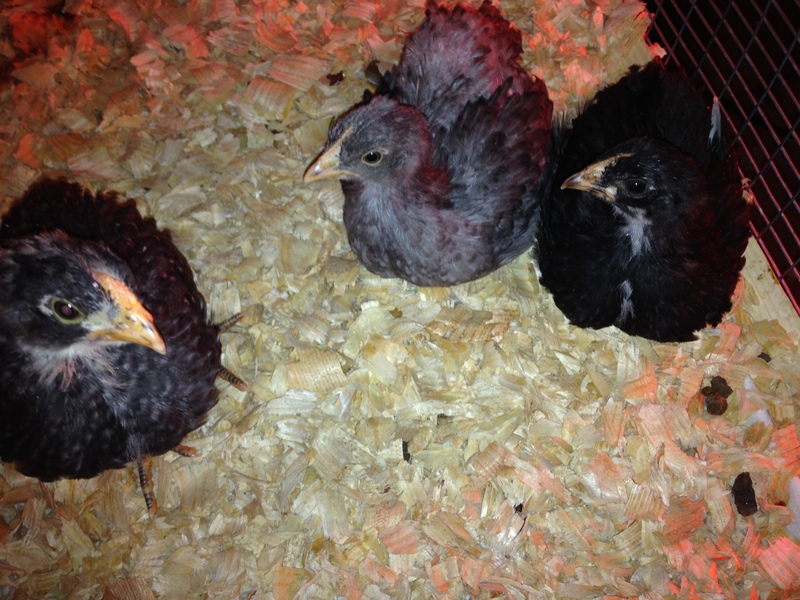 I cut out a wedge for them and put it in the brooder. They walked by it, indifferent. I was flummoxed. So after an hour, I sprinkled some of their chick food on top, and they instantly started pecking away. Soon they discovered the sweet red flesh, and gleefully pecked small holes in the watermelon. So after all of that excitement, no wonder they were pooped. For now, I will let them get their rest. What’s that saying about letting a sleeping bird lie? Good advice. Unless I’m up for some chicken acrobatics. NAME UPDATE: With all the amazing name suggestions we received during the contest for Loretta, we decided to lift one of the runner-ups to give Baby Girl a proper moniker. We decided to call her Nellie. Special thanks to Stacey who suggested the name through WordPress. Wonder if they will be pooping out watermelon seeds this week.